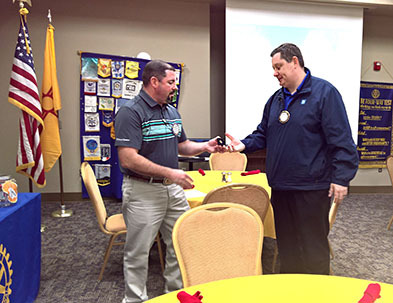 Above, Jesse Brownfield, left, president of the Rotary Club of Artesia, presents Chris Simons with the Rotary International Paul Harris Fellow Award, an honor recognizing individuals who have made extraordinary contributions to Rotary International programs. This is Simon’s second such award. 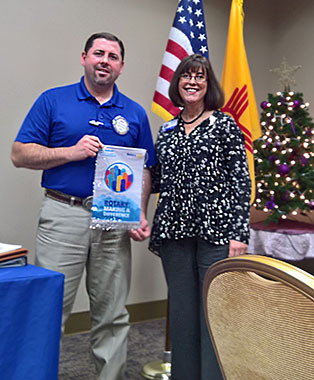 Below, Brownfield accepts the Rotary District 5520 banner from District Governor Doreen Kelsey. Kelsey addressed the local club with an update on Rotary programs such as the End Polio Now campaign, held in partnership with the Bill and Melinda Gates Foundation, which works to eradicate polio throughout the world. As a result, only three countries — Pakistan, Afghanistan and Nigeria — are endemic with the disease, and only 27 cases of polio were reported in the world in 2017. The Rotary Club of Artesia meets from noon – 1 p.m. each Tuesday at Hotel Artesia. Rotary members are dedicated to “Service Above Self” and welcome anyone interested in embracing this commitment to join.